12 Hour Challenge: All fluids must be thickened to “honey consistency” using a beverage thickener for a 12 hour contiguous period. Food does not have to be thickened. So I was challenged last week by Eric. I took that challenge and here is my video of the 12 hour experience condensed down to 4 minutes. As you can see I could not last that 12 hours. But it wasn't the gross factor that got to me, it was plain thirst. Thirst for cold thin runny liquids that the thickened stuff just wasn't satisfying. Actually the nectar-thickened pre-mixed apple juice was not bad at all. I just thought of it like an apple smoothie, and really didn't have any problems. Speech therapists do not universally love thickened liquids, in fact they may be concerned doctors rely too much on them. I nominated a few people but I do encourage anyone who reads this to nominate themselves and give it a try. And then to post a video! We will happily host videos as will GeriPal if you don’t have a YouTube channel. The posting is the important part! Participation and public sharing make this different than all of the people I told about this, who said, “Oh yeah, I did that when I was a (nurse/medical/speech) student.” Yet without sharing that experience more widely we miss out as healthcare professionals to do some education to our peers and the public. 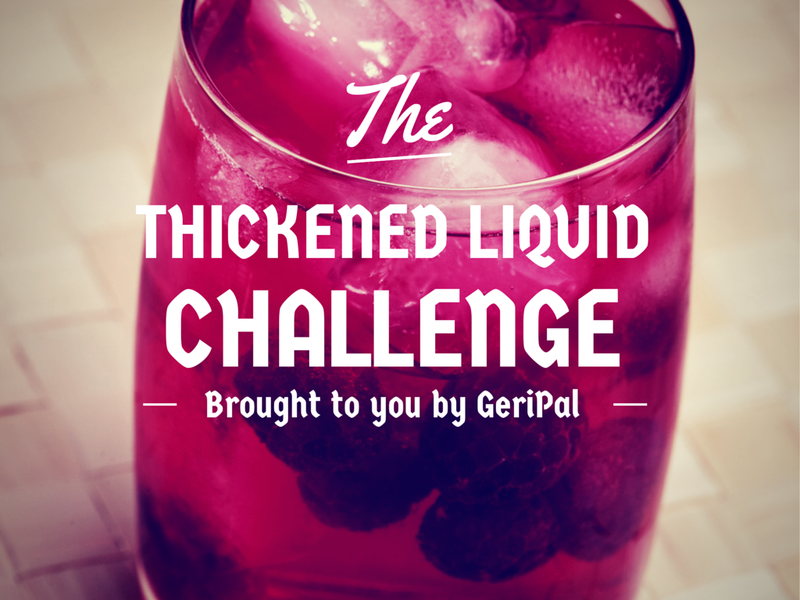 So I hope many of you will take this up and give the Thickened Liquid Challenge a try! Christian Sinclair, MD, FAAHPM is a palliative care doctor at the University of Kansas Medical Center and editor of Pallimed. When not advocating for health care professionals to use social media you can find him playing board games. National Drug Facts Week with Pharmacy Professor Mary Lynn McPherson! This week is National Drug Facts Week! Why do we tell patients to take furosemide on an empty stomach? Ok, it’s not quite “why did the chicken cross the road” but it’s still an important drug fact! The answer is that taking furosemide on an empty stomach doubles the bioavailability and clinical response! 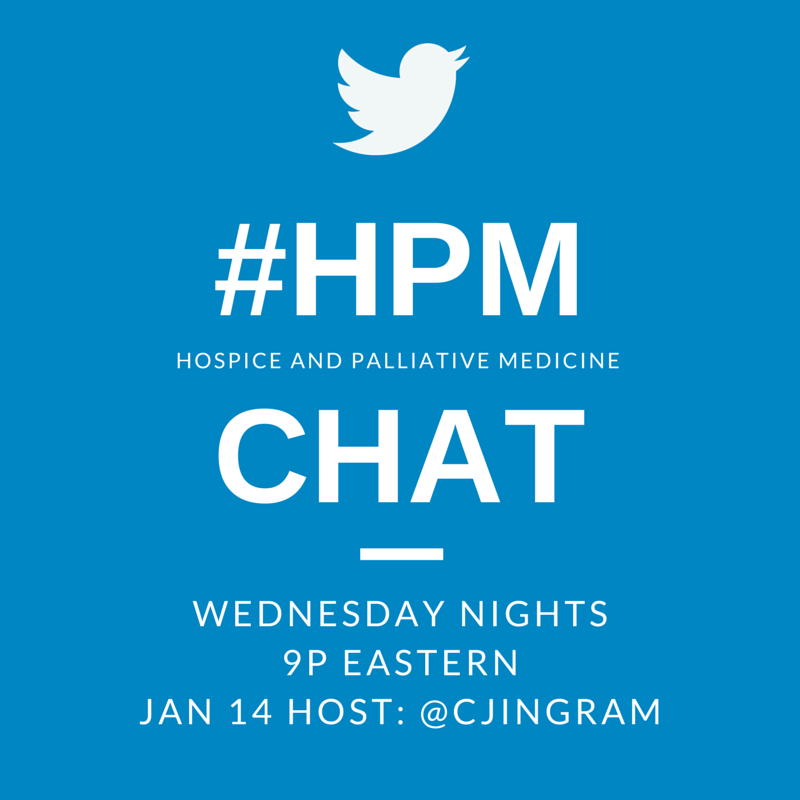 If you want to learn about additional awesome drug facts – tune in this Wednesday evening, January 28, 2015 at 6 pm PST/9 pm EST for the #hpm tweet chat! We’ll also be talking about the utility/futility of medications as patients approach the end of life. What strategies can palliative care teams use to set up hospice programs for success, and help patients achieve appropriate therapeutic goals? How can we have those sensitive conversations with patients, families and caregivers about stopping statins, dementia drugs, HIV medications, ALS meds and more? National Drug Facts Week is actually sponsored by the National Institutes of Health and the National Institute on Drug Abuse and is intended to educate teens about drug abuse and addiction. In that spirit we will also be discussing suspected drug abuse and/or diversion in the home environment. “The dog ate your morphine” you say? “Show me the body!” Ok, that might not be the BEST strategy, but there certainly ARE strategies we can use. I’m looking forward to a lively discussion this Wednesday evening! See you online! If you are new to Tweetchats, you do not need a Twitter account to follow along. Try using the search function on Twitter. If you do have a Twitter account, we recommend using nurph.com, for ease of following. Mary Lynn McPherson, Pharm.D., BCPS, CPE is Professor and Vice Chair of the the Department of Pharmacy Practice and Science at the University of Maryland School of Pharmacy. 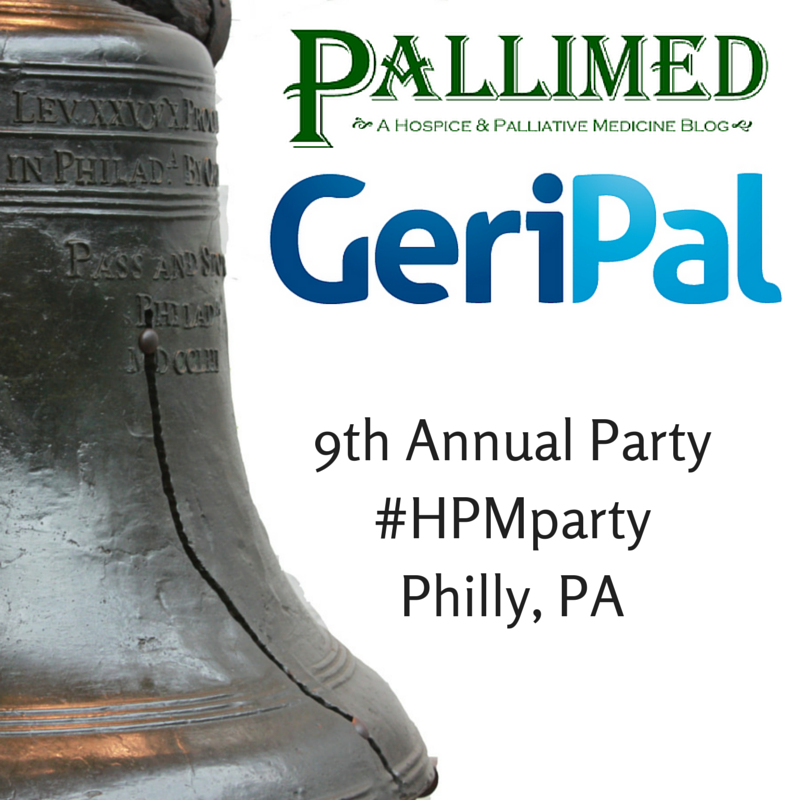 Time to gather your peers and join fellow readers of Pallimed and GeriPal for our annual party at the Annual Assembly of AAHPM and HPNA (and anyone still in town after SWHPN's conference on Monday and Tuesday!). Since the last two years were such a success with the progressive party, we will be doing that again this year. We will begin at McGillin’s at 8pm. After that follow the hashtag #HPMparty or our Facebook event page where we will be posting updates on the next location. All are welcome, this is no exclusive crowd. There will be many writers from both websites at the party and we always like to meet readers and hear your feedback. McGillin’s is near the corner of 13th and Chesnut just a few blocks South of the Marriott Hotel and Convention Center. The results are in and the public* has had their say! The top story of the year in hospice and palliative medicine for 2014 is Atul Gawande's "Being Mortal" being published and becoming a best seller on numerous lists. The honorable mention for story of the year was the Institute of Medicine publishing the Dying in America: Improving Quality and Honoring Individual Preferences near the End of Life. Here is the full list with links of all the top stories. Here is the complete list of the top stories by category with the notable person or organization indicated in parentheses. In an oversight, the Research and Education category was mistakenly left off of the poll. Pallimed will be awarding the winner of story of the year in the research and education. Here are the complete results. Scoring was ranked from 0-3 with 0 = no answer or not important; 1 = somewhat important; 2 = very important; 3 = extremely important. Some other interesting findings. A few people noted that we left the WaPo and Huffington Post investigative reports on hospice care off of the list. That was not an accident, it was intentional. While notable stories, we have some concerns about the quality of those stories as we have noted before. It is a good topic for conversation and one we will include in next year's poll on whether to include stories with more of a negative reputation. Also we asked how many of these stories were new to you at the end of the poll. On average the poll-takers score was 70% awareness of the stories which is good to know you are all informed! Thanks to all who participated in the poll! *and by public I mean 43 people. So clearly not a representative sample. This is the first year that we have done this and despite our broad reach on multiple platforms we learned a lot this year, and will be making a more invested effort in 2015. If you are interested in helping we are looking for people to help run future Pallimed polls and the end of the year review poll. 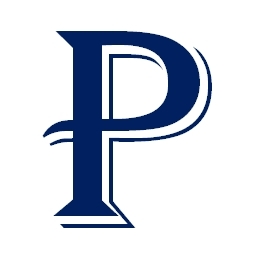 Email editor -at- pallimed -dot-org for more info. 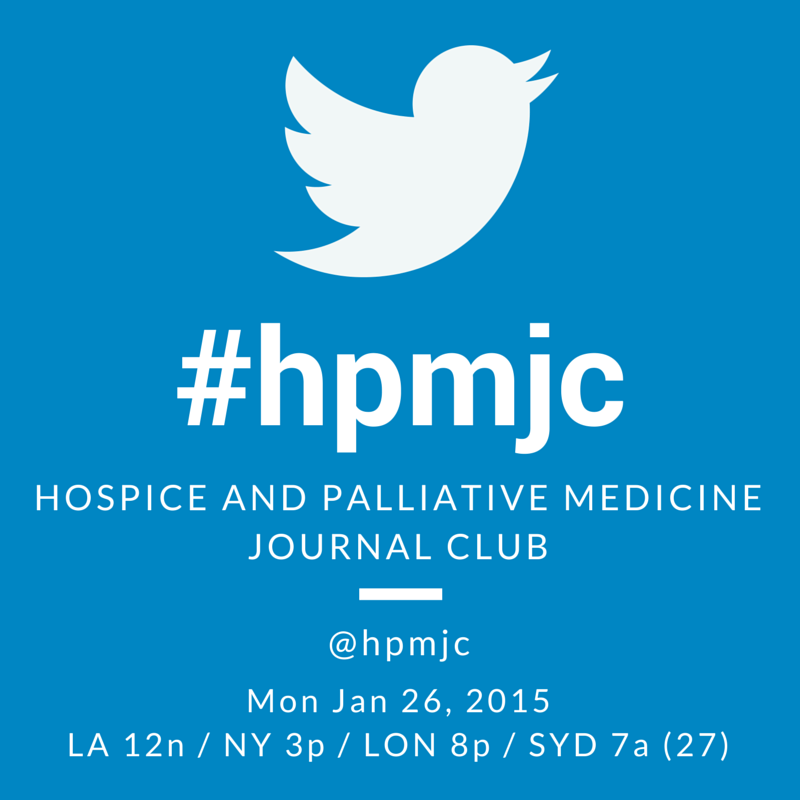 On Monday 26th January 2015 from 8-9pm London Time (3-4p New York/ET and Noon-1p California/PT) we will be holding the monthly twitter journal club for hospice and palliative medicine: #hpmjc. The aim of the journal club is to provide an informal multidisciplinary forum for discussion of latest research findings, and we hope you will join us! You can find some more information about the journal club #hpmjc here in a previous Pallimed post. Over the past decade there has been increasing emphasis on providing care for people with non- malignant conditions such as heart failure. This paper uses data from the Clinical Practice Research Datalink (CPRD) to investigate recognition of the need for palliative care in a traditionally underserved group. The authors use a national primary care database to investigate inequities with regard to recognition of the need for a palliative approach in heart failure in the primary care setting. They aim to explore whether people with chronic heart failure are identified as needing a palliative care approach, and to investigate the timing of this recognition in terms of the patient’s proximity to death. How was the data gathered? The CPRD is a longitudinal de-identified database of primary care medical records, including information gathered from 8% of all primary care practices in England. Data is collected on numerous clinical variables, and includes measures relating to the Quality Outcomes Framework (QOF). What is Quality Outcomes Framework (QOF)? The QOF is a voluntary annual reward and incentive programme for General Practitioner (GP) practices in the UK, started in 2004 as part of the new GP contract. Practices receive points for reaching targets and compiling registers of their patients with particular needs or conditions, for example the palliative care register and the heart failure register. The BMA provides a useful guidance document if you are keen to know more on the indicators used in QOF. The authors found that only 7% of patients with heart failure were entered onto a palliative care register, compared with 48% of cancer patients. In addition, 29% of heart failure patients who were entered onto the register were entered in their last week of life. The findings suggest that there is a large difference in recognition of palliative care need among patients with heart failure, compared with patients with cancer. Are you surprised by these findings? How might these findings impact on your practice? Are there any implications outside the English primary care system? What are the main strengths and limitations of this study? Should all heart failure patients receive palliative care? Regular journal club participant @Elissa_Campbell has written this post on participating in a #hpmjc chat on Twitter. 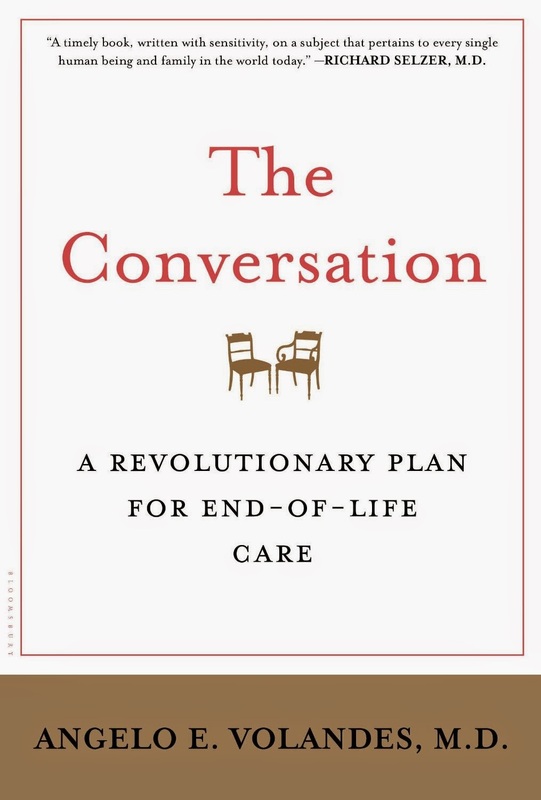 As a palliative care physician, The Conversation by Dr. Angelo Volandes is a book I want to see being read, passed along and read again in every coffee shop, book club and doctors’ lounge in my community. 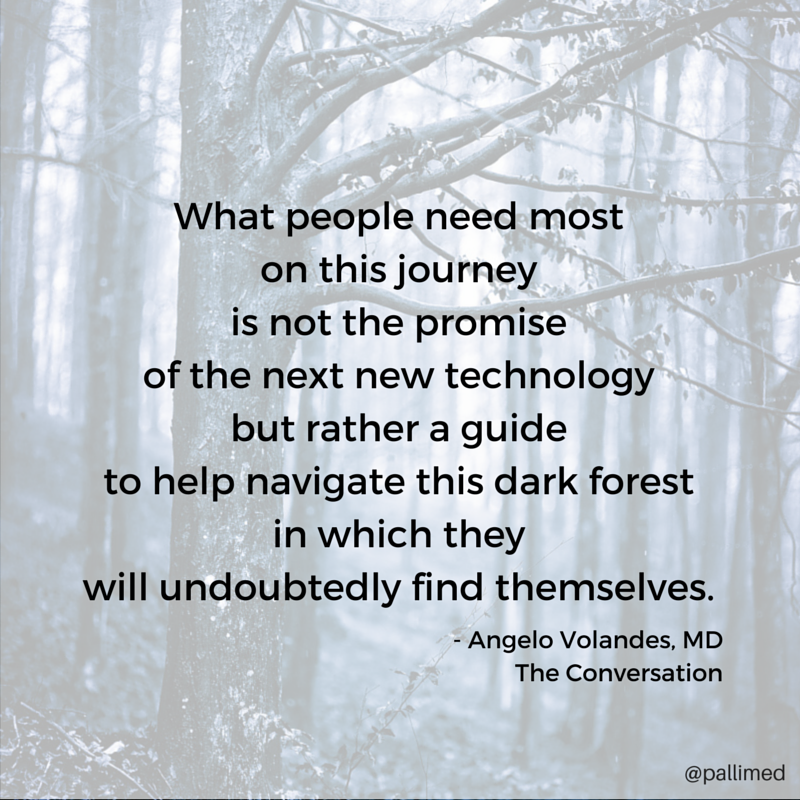 Volandes describes his new book The Conversation as a memoir, but in truth it is a “how-to” guide for having tough discussions in the context of serious illness. It is a “quick-start” for ubiquitous primary palliative care. Nothing in this book will be earth-shattering or revolutionary to the Palliative Care physician- it chronicles our every day experience. What makes Volandes’ book revolutionary is the way he makes it accessible to everyone. Describes the complex medical ethics concepts of proportionality, capacity and futility in a way that is easy to comprehend (5). Cites up-to-date national guidelines discouraging dialysis in the frail elderly (90). References the now classic NEJM article debunking the myth of effective TV CPR (79-80) and makes it accessible to a non-medical reader. His easy scripting is a model for physicians young and old wanting to practice goals of care conversations asking, “Mrs. Sanchez, how was your husband these last few months? Was he doing the things he enjoyed, things that gave him happiness?” (56) Then shows the progression of The Conversation over several days and as different interventions come into play, including the honest aspects of moral distress created by being a keeper of the patient story when the proverbial “Daughter from California” changes the plan of care (59-60). Half way through the book (62-63) and again in the four Appendices, Volandes provides a literal script for patients, families and providers to use when starting an uncomfortable conversation about wishes for end of life care. Appendix II provides a how-to guide for completing Advance Directives and Appendix IV is a brief list of online resources, including Ellen Goodman’s Conversation Project and CAPC’s public site getpalliativecare.org. Perhaps I will plant copies of this book in my local gym locker room and leave it on my neighbors’ doorstep. Andi Chatburn, DO, MA is a Palliative Care Physician and Medical Director for Ethics at Providence Health Care in Spokane, Washington where she enjoys XC skiing and dining on delicious food. You can find her on Twitter @achatburn. This Wednesday I look forward to a conversation on how palliative care principles and practices are able to be embedded across health systems in to various disciplines and delivery forms. Palliative care principles when applied in various clinical situations improve the quality of care for patients and families and even their longevity and care affordability. For the first time in history our society is experiencing an unprecedented medical and social situation. It is unprecedented that people are living longer, requiring more complex care, and experiencing more burdens of illness and treatment and dying more ill. The interventions employed in palliative care focus on symptom management, psychological support, ethical decision-making, coordination of care, spiritual support, prognostication, and goals of care conversations. In practice, I wonder if distillation of these principles to three main areas of focus can sustain the positive impact of palliative care. I wonder if delicate conversations, physical symptom management and non-physical symptom management embedded in all areas of our health system will improve the quality of care for seriously ill patients and their families. Are those three areas comprehensive enough? I also wonder if these three areas of focus will be embraced in various specialties like primary care? How would it work? Is it being done? What tools are needed? Are the barriers of skill, time and money able to be overcome and if so how? How do we influence training and attitudes? What is the relationship between primary and specialty palliative care? Join me @cjingram this Wednesday night at 8pm CST to explore the concept of palliative care everywhere. T1: What comes to mind when you think of #HPM everywhere? T2: What tools will advance #HPM everywhere? T3: What are and how do we overcome barriers to #HPM everywhere? Temel J.S. et al. Early Palliative Care for Patients with Metastatic Non-Small- Cell Lung Cancer. New England Journal of Medicine. 2010; 363:8:733-742. Bakitas M. et al. Effects of a Palliative Care Intervention on Clinical Outcomes in Patients with Advanced Cancer. JAMA. 2009;302(7):741-749. Morrison R.S. et al. Cost Savings Associated with US Hospital Palliative Care Consultation Programs. Arch Intern Med. 2008;168(16):1783-1790. De Roo M.L. et al. Quality Indicators for Palliative Care: Update of a Systematic Review. Journal of Pain and Symptom Management, 2013, in press. Quill T, Abernethy A. Generalist plus Specialist Palliative Care – Creating a More Sustainable Model. N Engl J Med. 2013;368:1173-1175. 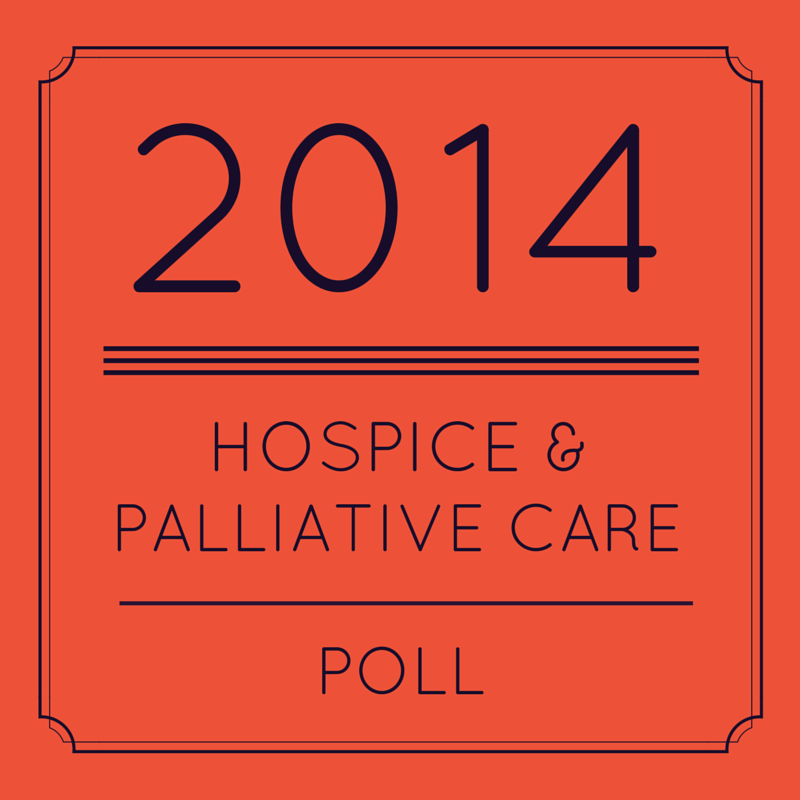 We would love to hear what you thought about the tops stories for hospice and palliative care in 2014. Have some fun and take our survey! (NOTE: POLL IS CLOSED - Ed.) If you want to learn more about the stories you see in this poll take a look at our year-end wrap up. We have never done a formal year in review here at Pallimed, and now that we are finally doing one, I’m sorry that I don’t have the past years to reflect back upon. Big shout out to Kathy Brandt for also doing a year-end review on her fantastic site the kb group (if you have not yet subscribed, you should.) She brought up a few ideas I had not had considered myself. CAPC also published a year in review worth a look. In addition, last week at #hpm chat, Dr. Meredith MacMartin hosted on just this topic. There was a lot of great discussion and some new topics were brought up that I was not aware of. And if you want to have a bit of fun with us, please join us in a poll to pick the top news stories of the year for hospice and palliative care. Don't forget to take the poll! Christian Sinclair is an palliative care physician at the University of Kansas Medical Center and editor of Pallimed. When he is not advocating for palliative care on social media (@ctsinclair), you can probably find him playing board games. This morning was like many on the weekends. I got up before the rest of the humans in the house, fed the dogs and let them out while I tooled around in the kitchen. The room was, I'll be honest, a typical after-holiday mess, so it took me a few minutes to notice the small package that had come unannounced in the mail the day before. It was addressed to me, like so many boxes had been in the weeks leading up to Christmas, but unlike those other boxes, I had no recollection of ordering this one. I opened the package, eager to see what I had forgotten that I had ordered only to find a gift-wrapped package that had been totally unexpected. 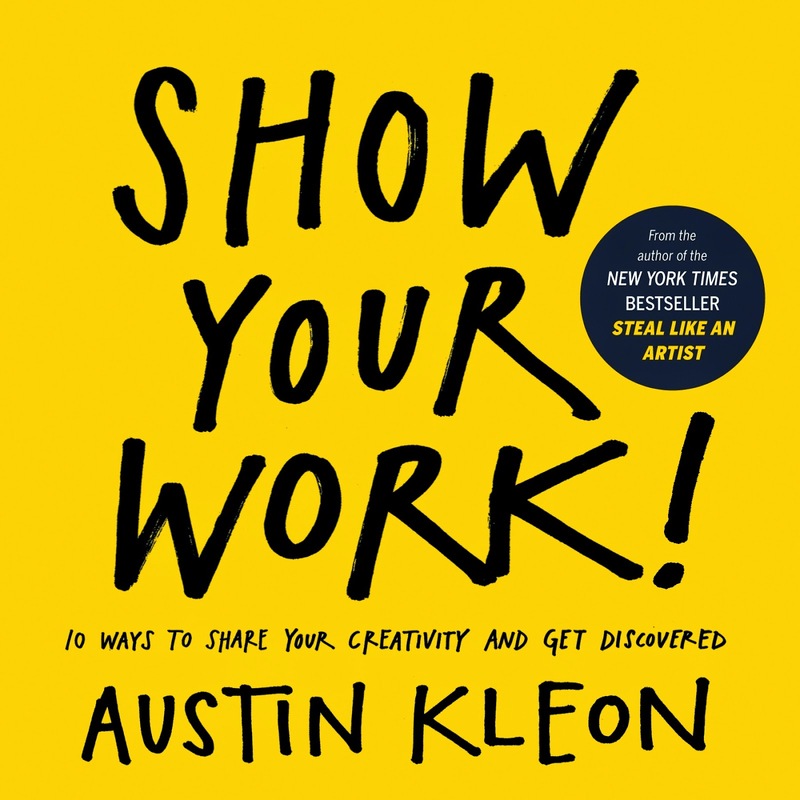 What was inside was inspiration, something that got me up and typing even before making coffee -- a copy of Austin Kleon's Show Your Work! 10 Ways to Share Your Creativity and Get Discovered. So far I have only cracked this book. I am still on the first concept, "you don't have to be a genius", but that one portion makes me want to get up and do, to make something and share it, no matter how simple. What this concept makes me think about is the growing fire that is hospice and palliative care. Not only are those of us that practice this on the cutting edge of holistic medicine/care, but we are a growing, passionate voice gaining a larger audience every day. We learn something daily, sometimes even hourly in our work and I am starting to see those lessons out there for the world to share in through social media posts, books, movies, and "newspaper" articles (that term feels a bit outdated now). The big take away from the book is no surprise: we in hospice and palliative care (HPC) need to “show our work”. We need to talk and write and tweet and so-forth about what we do. This is important for so many reasons, not the least of which is that it is the right thing to do. We practice a specialty that is doing amazing things for quality of life and in many cases, even quantity of that quality life. Something that I have heard in my practice and know that others out there have heard as well is the patient/family question “where have you been?”, meaning “why didn't I know about palliative care sooner”? Remember, I work with children, so this is parents asking this question, begging for this support. Not to say that all are open to the consult, but for many, they would have welcomed our faces at diagnosis and ask for us at each crisis or decision-point along the illness trajectory. So how do we show our work in an ever-changing world? Within our institutions/practices, that often means bending the ears of the people I've heard called “low-hanging fruit” – the HPC-friendly doctors, nurses, administrators, etc. are the easiest to collect, so we need to talk to them about what we do at every opportunity. Do you attend a committee that likes to start meetings with a connect-to-purpose? Tell a story about relieving a patient’s pain or helping her find meaning in her illness experience. We all talk about the “elevator speech” and having those ready, but what about when you have someone’s attention for longer than that? What will you say to them about your practice then? Another thing to be aware of within your institution is what the audience wants. If they want evidence-based practice, choose a palliative care article to share at a journal club. If they want staff support, discuss lessons learned from palliative care about coping and resilience. Working within our institutions, however, is not enough. We need to get our voices out to the community, both locally and nationally. Presenting at an HPC conference is great, as is writing for an HPC publication – these inform the field and improve what we do. In addition to these things, we need to broaden our focus to other audiences. I am speaking next month at a local workshop about professional burnout and ethics to mostly social workers. Although this won’t drive throngs of social workers into palliative care, it may educate some who practice medical social work and/or who may talk to their clients or peers about palliative care. What other avenues are out there for us to create opportunities to spread the HPC word? The final lesson that I wanted to share from this book is one of personal “promotion”, for lack of a better term. 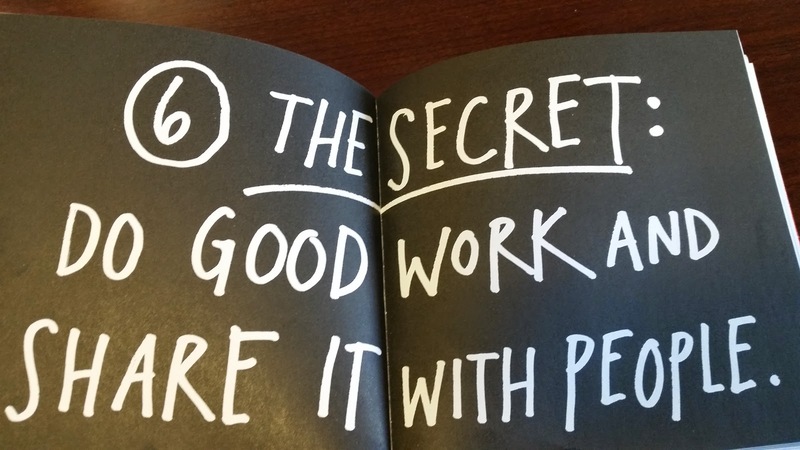 One of the things Kleon writes about is not being afraid to talk about yourself and what you are doing. Although this can have a secondary-effect of self-promotion, the true purpose behind this can be promotion of HPC. This is how collaboration is done – through an open sharing of information – and this is how we operate within this medical community we are a part of. So get out there, talk, write, tweet, sing, and paint about what you are doing. Share it with the world so we all can learn from you and grow our HPC fire together. I have worked as a hospice social worker, administrator, and researcher for 35 years. I now find myself a hospice caregiver for my husband who has Stage IV cancer. Despite my professional experience, I have had to learn many things about being a caregiver. Perhaps one of my most important lessons has been the unexpected experience of feeling “crazy”. I find my day-to-day reality is often in contrast to others around me, leading me to question my sanity. This is a new and unfamiliar distress not found in caregiving literature. It is however, not unique as I have heard these feelings and frustrations expressed many times by other caregivers in my support group encounters. A healthcare professional encounters a patient for perhaps an hour each week or every few weeks. I see my husband 24 hours a day, 7 days a week. Yet, during most conversations about his illness, I am not asked about my observations, I am not asked about my thoughts or feelings, he is the center of the experience. However, unacknowledged in this patient only centered approach, is the fact that there are challenges with my husband’s reports. For instance, there are times he doesn’t remember something. Most problematic with his reporting is his tendency to minimize his symptoms. Like many patients, he doesn’t want to complain, to be a bother, and he doesn’t want to appear to be a “bad patient”. In that office encounter, I hear him respond to questions by saying, “everything is fine, I’m doing ok”, again I feel crazy. Despite being able to fake it for a short encounter with a nurse or doctor he can’t fake it for the family. Like me, despite his impression management our children see the grimaces, notice the increased sleep and fatigue, and tell me they see changes between their visits. So maybe I’m not crazy? One helpful solution would be for the physicians and nurses to engage me in the visit, encourage my input, and encourage me to share my experiences and observations. But this is only part of the formula, for without making me feel heard, I will still silently imagine I am crazy. How can healthcare professionals circumvent family feelings of “craziness”? Dr. Marsha Linehan, creator of dialectical behavior therapy (DBT), contends that to help someone experiencing psychological distress it is important to first validate the person’s experience and communicate an understanding of the person’s perspective. The idea is to listen and recognize the distress and then acknowledge the right to “feel” that distress, thus normalizing the feelings. Dr Linehan identifies 6 levels of validation that can be used to improve the helping relationship. In summary, by first communicating that one is listening and understands, then problem solving, closeness, trust, and support become possible. Validating does not necessarily mean agreement. It is simply acknowledging a person’s emotions, thoughts and behaviors, respecting that those emotions have causes and communicating they are understandable. It is a very powerful tool in the building and maintaining of a helping relationship. I believe that if the members of our health care team used more validation, caregivers would experience significantly fewer moments of feeling “crazy.” The levels of validation identified by Dr. Linehan and described below take only a minute to use in conversation but can make a big impact. Level 1: Pay Attention. This is done by giving the individual undivided attention, looking interested, listening, staying focused and responding with appropriate facial expressions. For example, the nurse who leans forward to hear me speak, grimaces when I share something painful and nods occasionally as I speak. At its most basic level my feelings are recognized and acknowledged, I know that I was heard, even if a word is not spoken. Level 2: Reflect Back. In this case the provider reflects the thoughts and feelings they heard to insure understanding of what was said, without any judgment in tone or language. The doctor for example repeats what is heard, rather restating the words. “I hear you telling me that you feel very anxious that your husband is not getting better.” I know I was heard and the doctor helped me by reflecting it back, giving me a label for the feeling. Level 4: Understand. The fourth level of validation puts the person in context with their individual past experiences. In my particular case, the doctor might say, “I understand given your years in hospice why you are concerned with your husbands weight loss, that is understandable.” With this unique context, I feel understood, get a sense of why I feel anxious, and have permission for my feelings, thus I am not “crazy”. Level 6: Show Equality. 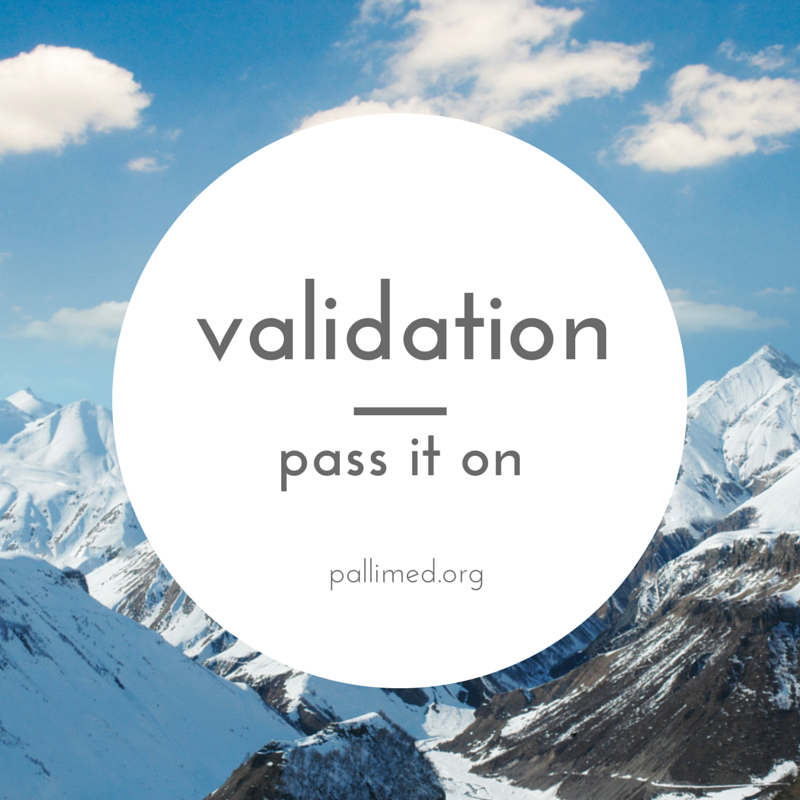 The final level of validation involves treating the person as a real person rather than a person with a specific problem who is unable to resolve it. The simplest example of this would be the doctor who turns to me after my husband tells them about his week and asks, “What have you noticed?” I feel not only listened to, but believe my opinion is of value and, I am viewed as a member of the “team.” I do not feel crazy. I urge hospice and palliative care team members to find as many ways as possible to validate the feelings of caregivers. Listen for the feelings behind the words, openly recognize the feelings, give them reassurance they are normal, and give them confidence they will be ok.
Linehan, Marsha M. (2015) DBT Skills Training Manual Second Edition. * New York: Guilford Press. For more great reads about social work see these other Pallimed posts. For more on caregiving from Pallimed, click here. The start of a new year is a natural time to pause and reflect, looking both back and forward, from past successes to future challenges. Self-reflection is a particularly useful skill in the field of palliative medicine, which requires us to navigate deep and often challenging waters with patients and families, touching on topics that often affect us personally. 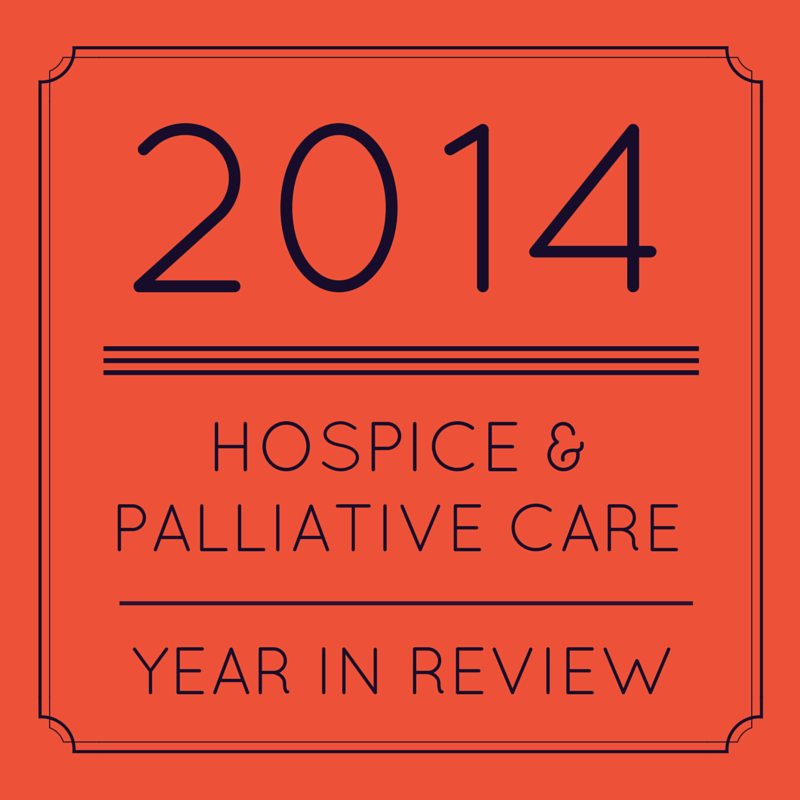 2014 was a big year for palliative care, with publication of the IOM report Dying In America, CAPC’s Payer-Provider Toolkit and changes to hospice regulations that prompted scrutiny of hospice agencies. 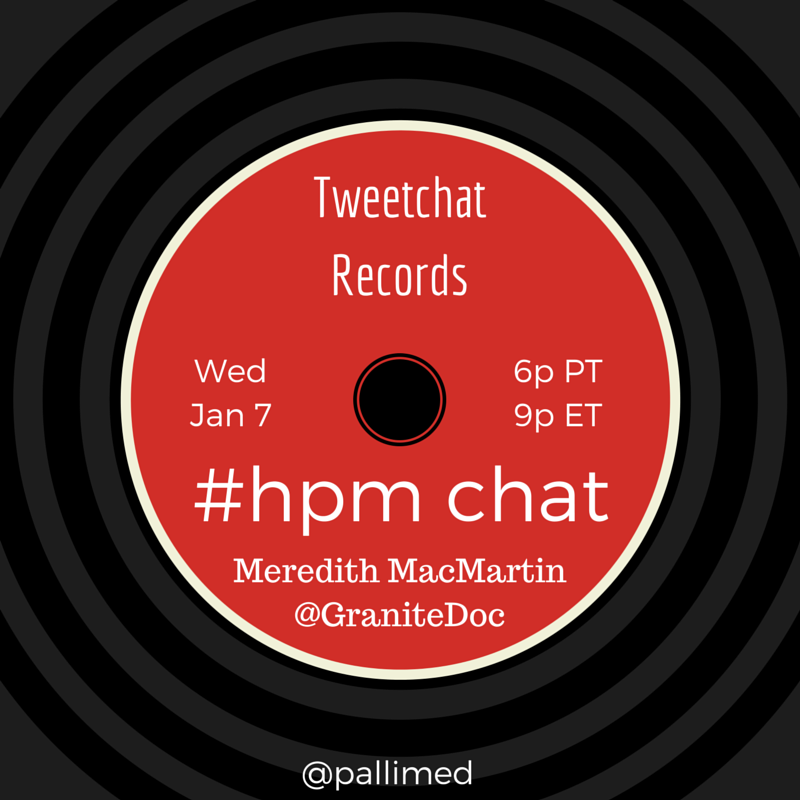 For the first #hpm Tweetchat of the year, let’s look at the events that touched us personally in 2014. What articles caught your attention or resonated with you? Was there a patient encounter that shifted your thinking about serious illness? 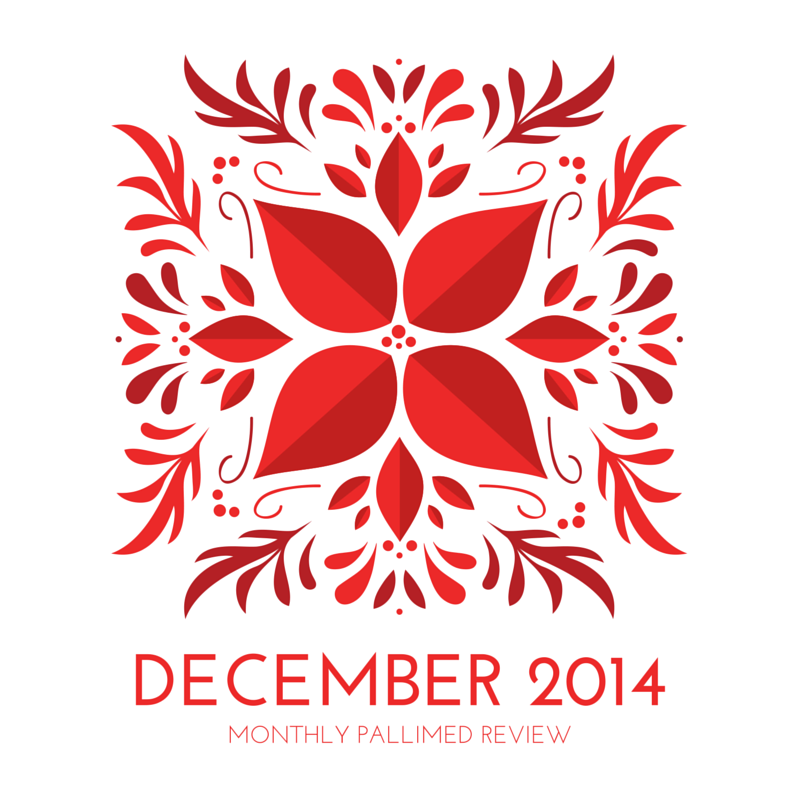 Maybe 2014 was the beginning of your interest in palliative and hospice medicine, what drew your attention to this field? And then, let’s look ahead to 2015. What challenges do you see for the field in the coming year? What are you excited about in your own palliative medicine and/or hospice practice? What do you hope to accomplish personally in our field? Join us Wednesday 1/7 at 6pm PT/9pm ET to start the year off right! 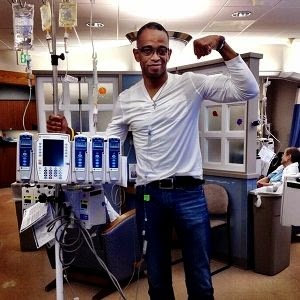 ESPN sportscaster Stuart Scott's recent death has given the American public a chance to reflect on what it means to live with a cancer diagnosis. His speech at the ESPY awards in the summer of 2014 was widely hailed as an inspiration to people with cancer. Obviously, the Jimmy Valvano Award for Perseverance with the ties to cancer research (Jimmy V Foundation) and Scott's own public image as someone being treated for cancer made it a very poignant moment. I encourage you to watch the whole video to best understand the context and tone of his delivery; a great speech by any measure (transcript here). What intrigues me is his mixture of language focused both on fighting cancer and maintaining quality of life. This speech has more layers than at first glance. It starts out with the very common fighting metaphors. "But I listened to what Jim Valvano said 21 years ago. The most poignant seven words ever uttered in any speech anywhere. “Don’t give up, don’t ever give up”. Those great people didn’t. Coach Valvano didn’t. So, to be honored with this, I now have a responsibility to also not ever give up. Coach Valvano’s words 21 years ago helping me and thousands of people like me, right now, direct benefits, that’s why all of this, why we’re here tonight, that’s why it’s so important." Scott uses this 'don't give up' attitude to emphasize supporting cancer research. He does tie it to his own battle, but really the call to action is for people to recognize the importance of research. And after that connection, he transitions to a stronger focus on himself and quality of life, but still mixed in with a fighting metaphor. I honestly don't think we would have heard this approach 5 or 10 years ago. It would have just been left with the fighting words. "Fight, fight, fight. I'm making a comeback." When most people hear that, there is a sense of relief, 'Phew! I don't have to worry about him or her dying because they are fighting and maybe they'll be one of the lucky ones!" But Scott amended that fighting trope and much like he did in his job as a sportscaster he created something new for the public's ears, something special, something palliative. BOO-YA! The most shared quote in news items about Scott is "When you die, that does not mean that you lose to cancer. You beat cancer by how you live, why you live and in the manner in which you live." Fighting language. Fighting language! I'll admit I used to cringe at fighting language when used to describe someone's approach to disease. I've published, tweeted, and shared articles which bemoan the overuse of fighting language in medicine. And I still have problems with it, but reflecting on Scott's speech in light of his death, and some of my own recent clinical experiences, I'm realizing we can use fighting metaphors instead of railing against them. Let's use them to fight for quality of life like Scott did. The core of his speech focuses on his support from friends and family, a palliative notion if ever there was one. "So, live. Live. Fight like hell. And when you get too tired to fight then lay down and rest and let somebody else fight for you. That’s also very, very important. I can’t do this “don’t give up” thing all by myself. What you didn’t see in the piece is what’s gone on probably the last ten days. I just got out of the hospital this past Friday. Seven day stay. Man, I crashed. I had liver complications. I had kidney failure. I had four surgeries in a span of seven days. I had tubes and wires running in and out of every part of my body. And guys, when I say every part of my body: every part of my body. As of Sunday, I didn’t even know if I’d make it here. I couldn’t fight. But doctors and nurses could. The people that I love and my friends and family, they could fight. My girlfriend, who slept on a very uncomfortable hospital cot by my side every night, she could fight. The people that I love did last week what they always do. They visited, they talked to me, they listened to me, they sat silent sometimes, they loved me. And that’s another one of the components of the V Foundation. This whole fight, this journey thing, is not a solo venture. This is something that requires support." Lots of fightin' words but the actions taken are all about caring for someone. Yes this last section starts out with tubes, wires and surgeries but that is about establishing the context, not the focus of the actions. The things that mattered to him was the visiting, talking, and listening. And lastly, he let's people know that he is vulnerable, even though he is appears strong on stage, giving a speech few could give. This vulnerability is really a defining moment of the speech, and interestingly not one many of the articles choose to focus on. "I called my big sister Susan a few days ago. Why? I needed to cry. It was that simple. And I know that I can call her, I can call my other sister Synthia, my brother Stephen, my mom and dad, and I can just cry. And those things are very important. I have one more necessity. Eh, it’s really two. Two very vibrant, intelligent, beautiful young ladies. The best thing I have ever done, the best thing I will ever do, is be a dad to Taelor and Sydni. (Yeah) [applause] It’s true. I can’t ever give up because I can’t leave my daughters. My littlest angel is here. My fourteen-year-old. Sydni, come up here and give dad a hug, because I need one." I think we could all fight a little harder for some hugs. Cases: Benign Prostatic Hypertrophy (BPH) as a hospice diagnosis? Mr. K is a 88-year-old man with advanced dementia who was brought to the emergency room for agitation and hitting another resident in the dementia unit of his nursing home. This behavior was not new for him. Mr. K, a veteran, spent his time pacing the halls; though he was not oriented, he spoke clearly (frequently about events during the war), ate well, walked easily, and was physically strong. Most of the time Mr. K was calm and could be redirected. However, he occasionally would become agitated and even violent. He would sometimes take his prescribed medications and sometimes refused; when he refused, it was difficult to persuade him and impossible to force him. Multiple medications had been prescribed for his agitation, including lorazepam, risperidone, and olanzapine; none were successful. When he came to the emergency room, he was discovered to have significant urinary retention. Two liters of urine were removed from the bladder, and he became calmer. More history from the patient’s daughter and the nursing home staff revealed that many of Mr. K’s episodes of agitation coincided with urinary tract infections (UTIs). Among the medications which Mr. K regularly refused was terazosin, prescribed for benign prostatic hypertrophy (BPH). Urinary retention caused by his untreated BPH made him more susceptible to UTIs and also caused pain which he was unable to explain verbally. An indwelling Foley catheter had been previously attempted; however, the presence of the catheter also seemed to cause him distress. How could Mr. K’s symptoms from BPH be treated in a way that would not worsen his agitation? The incidence of BPH increases with age, from 20% of 40-year-old men to more than 80% of men over the age 80. Common symptoms are urinary frequency, nocturia, urgency, hesitancy, weak or intermittent urine stream, straining to void, and sensation of incomplete voiding. There are two main types of medical treatment for BPH: alpha blockers and 5-alpha-reductase inhibitors. Alpha blockers work by reducing prostatic smooth muscle tone and have an immediate effect on urinary flow. Nonselective alpha blockers (doxazosin, prazosin, and terazosin) can also have systemic side effects, including dizziness, orthostatic hypotension and fatigue. Tamusolin is a highly selective alpha-1A-adrenergic antagonist which avoids these side effects but is more expensive. Studies of alpha antagonists have found an average 25-30% improvement in urinary symptoms. Five-alpha-reductase inhibitors (finasteride, dutasteride) act by preventing the conversion of testosterone to dihydrotestosterone in the prostate gland, thereby shrinking the gland. Men generally need treatment for 6 to 12 months before the size of the prostate is reduced enough to improve symptoms. For men with acute urinary retention due to BPH, many urologists recommend a trial of catheterization with use of alpha blockers, followed by attempts at spontaneous voiding. If this fails, transurethral resection of the prostate (TURP) is often performed. This procedure involves the insertion of a scope into the bladder, while the bladder is irrigated; the urologist is able to directly visualize the prostate tissue and resect it piece by piece. The procedure takes 60 to 90 minutes and can be performed under general anesthesia, with a spinal or epidural nerve block or a regional nerve block. For men who are not candidates for TURP and who have ongoing urinary obstruction, catheterization is an option. A foley catheter can be placed in an office setting, but carries an increased risk of urinary tract infection. Intermittent catheterization can also be used for long term management of urinary obstruction. The final option is a suprapubic catheter, which is placed surgically through the abdominal wall and into the bladder. This reduces trauma to the urethra and the incidence of bladder infection. Mr. K’s daughter met with palliative care, psychiatry, internal medicine and urology to discuss the options. Medical treatment for BPH was unlikely to be successful in reducing further episodes. Intermittent catheterization was discussed with urology; however, due to the size of his prostate, catheterization was extremely difficult. Even if Mr. K would allow it, it couldn’t be done by nursing home staff. TURP might be the most effective treatment for him, but the urologists did not recommend that or any other surgical procedure due to his overall health and his lack of ability to adhere to post-operative care. It was decided to attempt an indwelling Foley again; however, even with the administration of haloperidol prior to the procedure, Mr. C became so distressed and agitated that his daughter asked the urologists to stop. The next day we met again, and in accordance with Mr. K’s daughter’s goals for her father decided not to attempt further catheterization or to force medications. She thought Mr. K would not want his life extended at all in his current impaired state. We would attempt to reduce Mr. K’s BPH with measures that were not intrusive to him by continuing to offer him alpha blocking medication and a five-alpha-reductase inhibitor, and by discontinuing any medications that could increase urinary symptoms such as diuretics, anticholinergic agents, and tricyclic antidepressants. When he did have agitation we would assume that it was due to obstructive symptoms and would treat the discomfort with sublingual morphine. Eventually we expected that his bladder would become infected leading to sepsis, or urinary obstruction would damage his kidneys and he would go into renal failure. Rather than treating with antibiotics or readmitting to the hospital, we would keep him comfortable in his current setting. In this case, a simple condition that is easily treatable in most men became one that we expected to lead to Mr. K’s death. However, the diagnosis that led it to become life-limiting was Mr. K’s dementia, and the heavy burden which BPH treatments would have placed on him. Mr. K’s daughter based her decision on Mr. K’s values, saying that if the father she was raised by was able to see himself in his current condition, he would have wanted both to stay in place and to be allowed to die with dignity. Forced catheterization and antipsychotic treatment might have prolonged his life by years but would have caused terrible suffering to himself and his family. With the decision to allow his BPH to progress with minimal intervention, we were able to discharge Mr. K to enroll in hospice at his nursing home and completed a POLST form indicating “comfort measures only”. 1.) American Urological Association Guideline: Management of Benign Prostatatic Hyperplasia (BPH) 2010. http://www.auanet.org/education/guidelines/benign-prostatic-hyperplasia.cfm Accessed August 24, 2014. 2.) Burnett AL, Wein AJ. Benign prostatic hyperplasia in primary care: what you need to know. J Urol 2006; 175:S19. Pallimed Case Conference Disclaimer: This post is not intended to substitute good individualized clinical judgement or replace a physician-patient relationship. It is published as a means to illustrate important teaching points in healthcare. Patient details may have been changed by Pallimed editors to help with anonymity. Links and small edits are made for clarity and to abide by Pallimed editorial standards. If you have not noticed by now, we have really started to increase our publishing output, so since some great articles may fall off your radar, we will start doing a monthly review to make sure you didn't miss something really good. And if you are one of the few hundred subscribers with a daily option, do not forget you can always change to MWF or weekly! Our two most popular posts this month on social media were Emily Riegel's letter to the spouses of palliative care professionals and Bob Arnold's case review of when emotions or facts are at the center of goals of care discussions. Good ones to share with your teams maybe? Make sure to follow, engage, like and comment with us on Facebook, Twitter, Google+, Pinterest, Tumblr and LinkedIN. And we always appreciate it when you recommend us to your peers. Kyle Edmonds, Clay Anderson, Bruce Scott, Ruth Hill, Kathy Kastner, Michael Chapman, George Handzo, Karen B. Kaplan, Liz Salmi, Drew Rosielle, Hal Grotke, Robert F, Michael D. Fratkin, Judy Connolly, Earl Quijada, Anette K, Jason, Tarris Rosell, Sonia Fullerton, Conrad Williams, Emily Riegel, Allie Shukraft, Marilyn Hofmann-Jones, Amy Getter, Holly Yang, Chri Okon, and a few anonymous people. "Fact clubbing" - I'll start using that. The last few years I've called it 'The Data Dump' in my attempts to help other docs understand how it's a waste of their time and effort. I think it's tough to teach about this on the fly to docs who don't seem to understand they are data dumping. They are taught how important it is to educate the patient and family on what's going on and feel it's an important duty and may not have a sense that it's effect ranges anywhere from being just a waste of time to frankly damaging the doctor patient relationship. I sometimes tell people (not peers, but residents etc) they are at risk of the main point their patient comes away with is 'Gee my doctor is really smart and knowledgeable' but not what you were actually trying to communicate it. I think the most effective way of teaching around this point is in communicaiton workshops where you can get docs to role play being a patient (or being a customer at an autoshop even) and then have someone talk to them about what's going on for 120 seconds straight. Many can realize that they start glazing over and not paying attention after just 30 or so seconds. Sometimes can lead to great insights. Sometimes. Bob; fantastic post I'm going to use this in teaching. If you are interested in writing for Pallimed please contact us via any of the social media platforms or email editor@pallimed.org. If you want to help we have something you could do! Like write this simple monthly review post! Or help run one of our social media accounts (especially with Pinterest and Tumblr) - we do on the job training!